Klan Rally in Colfax, Washington, September 1923. Colfax was a hotbed of what was a particularly strong KKK presence in the Palouse. Courtesy UW Civil Rights & Labor History project. Here is a fascinating archive of an aspect of state history that we have tried to forget: Documents from the Washington State KKK in the 1920s. The archive is part of the Labor and Civil Rights Project at the University of Washington, which includes 11 projects which "bring together nearly one hundred video oral history interviews and several thousand photographs, documents, and digitized newspaper articles ... films, slide shows, and lesson plans for teachers" along with "several hundred essays about important issues, events, and people." It is a rich resource. The Ku Klux Klan in Washington State reminds us of just how large a force the Klan was in our corner of the world. Historians often refer to the organization in the 1920s as the "Second KKK." 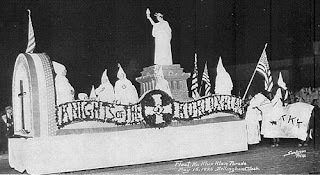 Unlike the first KKK, which was a short-lived (though brutally effective) terrorist organization in the states of the defeated Confederacy, this second rising of the Klan was better organized, more widespread, and expanded its message of hate to target not only blacks but Catholics, Jews, and recent immigrants. And it was popular, with millions of registered members nationwide. To explore the collection I focused on one section: Newspaper Clippings from Pullman and Colfax. It is a small subsection of the site with just 11 articles but it paints a vivid picture of the Palouse in the grips of the Klan fervor. A November 1922 article from the Colfax Gazette, "Klansmen Visit Christian Church," recounts how a recent meeting of the Christian Church was interrupted when "six white-robed figures silently entered" the building during services. They handed the minister an envelope which read "Please open and read after we retire, K.K.K." The envelope included $30 for the congregation and a proclamation of the KKK's purported principals, including "the supremacy of the Divine Being," the supremacy of the constitution, and "the sublime principles of pure Americanism." The county seat of Colfax seems to have been a Klan hotspot, with many members and a sympathetic newspaper editor. A few weeks after the church appearance the Gazette featured another article friendly to the Klan, titled "Klansmen Do Not Tar and Feather." The article described how the Reverend L. E. Burger of Walla Walla, "official spokesman of the Ku Klux Klan," gave a speech to packed audience of 1000 people at the town auditorium. "We are not men who go out at night and commit unlawful acts," the Reverend declared. The Klan, he declared, was "law abiding" and "opposed to the I.W.W. and the bolshevik and every I.W.W. organizer in the United States." He also declared that "it was not intended that the races shall mix. Let's keep our race pure." Berger ended with a plea for new members and by passing the hat for donations. Soon the Klan was riding high in this part of the Palouse. H. J. Reynolds, a Pullman minister called for the establishment of a local chapter of the KKK to prevent "desecration of the Sabbath" and to suppress "the red element, the local bootleggers, and other evils." 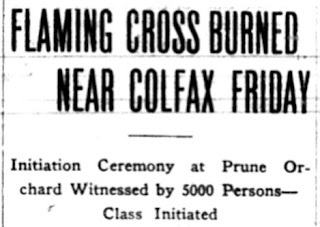 By October of 1923 a crowd of 5000 resident of Colfax and surrounding areas turned out to watch Klansmen burn a 90-foot cross and initiate 125 new members into the group. The article made a point of noting that the ceremony took place "in a field owned by County Commissioner P. M. Price." The article noted that "cars were parked along the road for a mile and a half in any direction from the entrance." There was also opposition, and the Pullman Herald seems to have led the anti-Klan movement in the area. A stinging January 1923 editorial in the Herald declared that although one of the objects of the Klan was "to perpetuate and to cultivate true Americanism," the methods which it uses to obtain this object are absolutely un-American." A September editorial congratulated the mayor of Lewiston, Idaho, for ordering the police there to arrest Klansmen who engaged in vigilante activity. The Palouse was by no means unusual to have so much Klan activity in the early 1920s. Much of America--especially the more white, rural areas--was in the grip of the Klan in those years. The organization claimed 4-5 million members by the mid-20s. Politicians were afraid to denounce it, and many actively sought its endorsement. Washington State had a very active Klan presence. In 1926 there was a massive KKK rally in Issaquah, and in 1929 the Washington State chapter of the KKK held a convention in Bellingham, where the mayor gave the leader a key to the city. The highwater mark of the Washington State Klan was in 1924, when the KKK backed a ballot measure that would have outlawed private schools, most of which were Catholic. Though a similar law had passed in Oregon the year before, Washington voters rejected the measure 2-1. By the late 1920s this second KKK was in rapid decline. Feuding leadership, some high profile scandals, and the onset of the Great Depression all contributed, as Klan rolls nationwide shrank to around 30,000 supporters by 1930. This decline was mirrored in Washington as well, as mentions of the Klan in regional newspapers slow and then halt altogether as chapters became inactive. These handful of articles from Colfax and Pullman paint a striking picture into Klan activity in one small section of our state. There are hundred of other articles to explore at the Labor and Civil Rights Project, such as the fascinating "The Washington State KKK and the U.S. Navy." 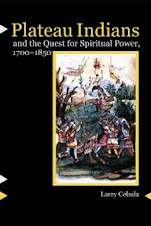 The site is a great resource for teachers willing to tackle tough historical issues as well.